This month marks the 204th anniversary of the events that lead to calling the American flag the Star Spangled Banner and the national anthem that’s associated with it. Mary Pickersgill, along with her daughter, two nieces, and an indentured servant, made the Star Spangled Banner in 1813 as part of a two flag commission. The original Star Spangled Banner was 30 by 42 feet. The flag lost eight feet of length by the time it had arrived at the Smithsonian in 1907. The loss was attributed to use, age, and the small fragments people clipped off as keepsakes. At the time it flew, during the War of 1812 with Great Britain, it was the largest battle flag to be flown. When the British attacked Baltimore in 1814, the flag was flying over Fort McHenry in Baltimore Harbor. The flag features 15 stripes and 15 stars that represent the 13 original colonies and the next two states to join the Union: Kentucky and Vermont. The blue square of the American flag is known as the canton or the union. Plant dyes made from indigo and the roots of madder plants were used on the wool fabric to get the blue union and red stripes of the flag. Each of the stripes on the flag are 23 inches wide and are made of two wool strips that are pieced together. Each of the stars on the flag are made from cotton, and are two feet wide! 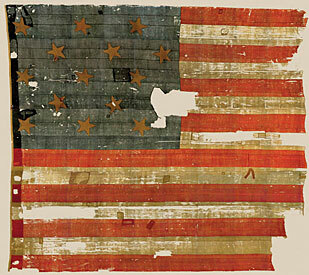 Click the text that follows for more information on the original Star Spangled Banner with the Smithsonian Institute’s interactive flag. The Smithsonian Institute also features a video of the story behind the flag and the national anthem. Including information about how the museum protects the flag and where you can find it.